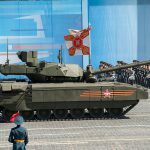 The unveiling of the Russian T-14 ‘Armata’ at the Moscow Victory Day Parade in 2015 has exposed the growing obsolescence of current NATO main battle tanks (MBT) and Western military planners have been ignorant of the need for post-Cold War armoured formations. The current British and American MBTs, the Challenger 2 and the M1A2 Abrams have been in service for over a decade and have seen few combat deployments other than the 2003 Iraq War. Other NATO members operating sizeable MBT forces, for example Germany, are also relevant to this debate, but the issues discussed in this article can also be applied to MBTs such as the Leopard 2 without the need for technical specifics. To effectively examine how both NATO MBTs are close to obsolescence, three keys areas must be underlined for debate; Survivability, Firepower and Mobility. All three areas are vital for an effective tank, as argued by armoured theorists and historians including Heinz Guderian, Patrick Wright and Richard Simpkin.1 During their first years of service, arguably both the Challenger 2 and the M1A2 excelled at these three areas, combining resilient armour, powerful armaments and capable mobility systems with few flaws. By modern standards, particularly when compared with the T-14, the once-modern systems of both NATO MBTs begin the show their age. The Challenger 2 and M1A2 epitomised the peak of NATO armoured development in the 1990s. The Challenger 2 entered service with the British Army in 1998, mounting a 120mm rifled gun on a heavily armoured chassis, driven by a diesel engine. Comparatively, the M1A2 entered service with the US military in 1992, keeping many of the characteristics of its predecessor, the M1A1, while improving on the optical and fire control systems alongside a new generation armour package. The Challenger 2 and M1A2 saw service during the 2003 Iraq War, where they engaged mainly with Soviet-era T-72s upgraded by the Iraqi military. In their conventional role, the Challenger 2 and M1A2 performed well, taking minimal losses to enemy armour. However, a shift in focus towards a counter-insurgency (COIN) doctrine in Iraq, the limitations of MBTs in this environment became evident, as they became far more vulnerable to improvised explosive devices (IEDs) and modern anti-tank systems in an asymmetrical environment. With this change in focus, a major flaw in NATO military planning becomes evident. The British government, fighting both COIN operations in Afghanistan and Iraq, cut the number of Challenger 2 tanks by 40% in the 2010 Strategic Defence and Security Review (SDSR).2 Moreover, the end of the Cold War removed the Soviet Union as a major threat to Western Europe, with large numbers of British and American MBTs being withdrawn from the region. With the introduction of the T-14 in 2015, it is easy to argue that with hindsight, NATO military planners, along with British and American decision makers, ignored the continued relevance of armoured formations in favour of short term requirements. The British government for example, belatedly realised that conventional armoured formations needed to be maintained, acting upon recommendations from the 2015 SDSR to begin a programme known as the Challenger Life Extension Programme (LEP). Comparatively, the United States has continued to upgrade the M1A2 to the SEPv3 version with a similar goal to the Challenger LEP. Both programmes are aimed at modernising the systems of both tanks in the three key areas of tank design. 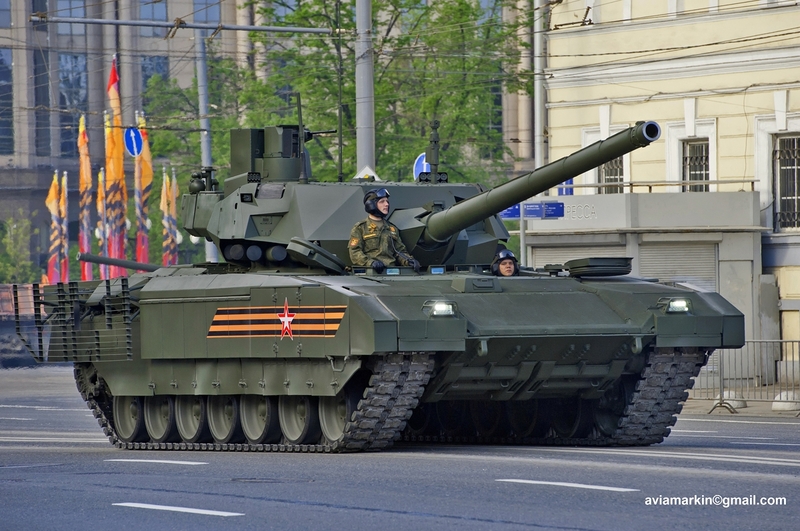 The T-14 Armata provides the latest rival to the NATO MBTs. Arguably the first major new tank design to come out of former Warsaw Pact and NATO militaries since the end of the Cold War, the T-14 represents a marked change in tank design. Assessing the T-14’s suitability to the common criteria of armoured design demonstrates an educated understanding of tank design by the Russian military. Mobility has always been a difficult factor to balance against the other two criteria, achieving good mobility usually comes at a cost to firepower and survivability. To this end, the T-14 has maintained a relatively low weight when compared to the Challenger 2, which weighs 62 tons.3 Furthermore, the Armata employs improved suspension and an efficient diesel engine, allowing it to maintain good operational range and strategic mobility. Firepower is achieved by a multi-purpose 2A82-1M 125mm smoothbore gun alongside several self-defence machineguns, furthermore, unlike Western tanks, Russian and preceding Soviet tank guns have been capable of firing anti-tank guided missiles (ATGMs) and this trend is continued by the Armata. Survivability is the most radical change in the T-14 and thus presents a good starting point to examine the NATO tanks. The Challenger 2 and M1A2 share British designed armour collectively known as ‘Chobham’. The composition of this armour is still classified, furthermore, neither tank have been engaged with modern Russian armour; therefore, it would be of little value to speculate on the true strength of the armour, but from experiences in the Iraq War, both tanks have been known to take minimal damage from multiple anti-tank weapons, mainly of the rocket-propelled grenade type (RPG). Regardless of the lack of information, it must be considered that modern Russian anti-tank weapons can defeat the standard level of armour. To maintain a sufficient level of survivability, the Challenger 2 and M1A2 can be outfitted with additional measures in the form of explosive reactive armour (ERA) and armour blocks. This has the detrimental effect of adding substantial weight to already heavy vehicles but provides no guarantee that the tank will not be damaged or destroyed. By comparison, the T-14 Armata utilises several means of survivability alongside traditional armour. Arguably the most revolutionary, is a defensive measure known as an Active Protection System (APS). The integration of an APS into the T-14 demonstrates how far behind Western tank designers are in recognising new, lighter and more effective armoured survivability systems. APS systems are growing more popular in modern tank design owing to the value for money of both soft and hard-kill APS systems. This factor makes them an attractive alternative to heavy armour packages like the American TUSK armour kit. Israeli experiences of the use of Trophy have proven that asymmetric threats, such as those from RPGs and ATGMs in urban areas not only prevents damage to MBTs, but also removes the mobility challenges that additional armour packages bring with increased weight and profile. Fortunately for the M1A2 and the Challenger 2, modern APS systems can be easily integrated onto the vehicle, however, there is a two-year gap between the unveiling of the T-14 and the trials of APS systems on both NATO tanks and six years since the first operational deployment of Trophy in Israeli service. This raises the question of whether British and American decision makers, given the proven effectiveness of Trophy along with the Russian recognition of the value of APS, miscalculated or ignored this fact, instead preferring to focus on short-term strategy with the conflicts in Iraq and Afghanistan, leaving armoured forces greatly disadvantaged with the prospect of another conventional standoff. If the current NATO tanks are at a disadvantage when defending against modern Russian tanks, the debate over whether they possess the firepower to defeat them is also raised. Since the 1980s, NATO standard calibre for tank guns has been 120mm, with the M1A2 and Challenger 2 possessing only the calibre in common. The M1A2 mounts the 120mm M256 smoothbore gun, derived from the German L/44 gun mounted on the Leopard 2 MBT. The Challenger 2, in keeping with past British armour design, mounts a 120mm rifled L30A1 gun. The Challenger 2 is unique in having a rifled armament amongst NATO MBTs. Both guns mainly use armour-piercing, fin stabilising, discarding sabot (APFSDS) rounds for the anti-tank role. Despite being effective against armoured vehicles in the Iraq War, the T-14 once again highlights the concern over current NATO tank armaments. Rheinmetall, developer of the L/44 gun moved to design a new 130mm gun in 2016 in response to the T-14.7 Neither the M1A2 or Challenger 2 have yet committed to a wholesale change in armament. The Challenger 2 however presents a significant example of project failure. With the Challenger 2 being the only rifled gun in the NATO MBT arsenal, the British Army is at a disadvantage. The Challenger 2 cannot share ammunition with other NATO tanks like the Leopard 2 operated by many European nations and upgrades to NATO standard 120mm ammunition and systems are incompatible with the L30A1. To try and resolve this, the British government undertook CLIP, the Challenger Lethality Improvement Programme in 2006. The aim of this programme was to determine the suitability for a change from the 120mm rifled gun to the smoothbore 120mm L/55 to allow commonality with other NATO tanks. The programme never took off, with only a single (albeit functional) Challenger 2 being fitted with the necessary equipment for testing purposes. With the announcement of the CLEP programme, the switch to the L/55 was again considered but now does not look to be part of the upgrade package. From this, two conclusions can be identified. Firstly, CLIP (and to a lesser extent, CLEP) highlights British ignorance towards an evolving armoured threat. As with improvements to the M1A2, it can be argued that CLEP is too little, too late. While there is no doubt some improvements can be made to the fire control and command systems of the Challenger 2, this still does not remove the ageing rifled armament or limited ammunition. There is no indication that the British government plans to include lethality improvements as part of CLEP, whether this is a decision taken on financial or political grounds remains unknown. It is clear however that with the pace of Russian and European advances in tank armaments and survivability systems, the Challenger 2 faces the very real threat of being obsolete before CLEP even becomes operational. Secondly, with interoperability being one of the main advantages of NATO, the Challenger 2 is alone in this regard. The M1A2 can benefit from improvements made to the L/44 and L/55 guns in the NATO arsenal along with a shared ammunition pool. While CLIP has demonstrated that a 120mm smoothbore can be integrated into the Challenger 2, this does not provide the most ideal solution, given that the financial cost of converting current MBT stocks over to smoothbore guns may prove of no value if they eventually are replaced with guns such as the 130mm L/51. One redeeming quality of NATO MBTs has been mobility. Mobility is often tertiary to the other factors. Despite this, mobility can be severely hindered by alterations to survivability and firepower systems. All major NATO tanks, the M1A2 and Challenger 2 included, weight over 50 tons at the very basic level of configuration. Additional armour packages may add several more tons to the total weight, further decreasing the mobility of the tank. There are two elements to the mobility factor of a tank, strategic and tactical. From a strategic element, this governs how easy the tank is to transport either by rail, road, sea or even air. From the tactical element, this includes factors governing how well the tank performs under its own power and reliability. Strategically, the movement of armoured assets has been confined to road, rail or sea transport links. NATO doctrine currently advocates for rapid deployment forces, deployed from the air or kept in forward locations. Unlike the challenges posed by the survivability or firepower shortcomings on the Challenger 2 and M1A2, mobility arguably presents the least pressing of issues for future NATO tank design. Strategically, NATO has kept active and reserve divisions in forward locations to negate the issue of strategic mobility. Only the British and American militaries need to consider sea transport routes when deploying forces to continental Europe as air transport routes are unsuitable for large scale armoured movements. Current NATO doctrine focuses on smaller armoured elements accompanying larger, more mobile units backed extensively by air support. Tactical mobility can be examined from two perspectives. Firstly, the overall performance of the tank itself. Secondly, how the tank’s mobility supplements the survivability and firepower capabilities of the tank. In the case of the Challenger 2, designers stuck with a diesel engine commonly used in MBTs. The United States however chose to power the M1A2 with a gas turbine engine which is unique to the NATO arsenal. While this creates logistical problems for the M1A2, it does present a greater power to weight ratio than a comparable diesel engine. The key difference in this matter is how this contributes to survivability and firepower upgrades. Both the M1A2 and Challenger 2 have access to additional armour kits which add further weight to an unaltered powerplant, severely impacting the mobility performance of the tank in general. Compare this to the T-14, where a new design has allowed for considerations in how survivability or firepower upgrades may affect mobility, the Russian military clearly demonstrates a competent understanding in this regard. While retaining a diesel powerplant like the Challenger 2, substituting additional armour kits with APS systems for example allow for significant weight savings while not compromising survivability. Overall, poor mobility has less of an impact on performance than inefficient survivability and firepower capabilities. There are many examples where tanks with poor mobility through design choice or technological limitation have performed remarkably well in combat; the first tanks could only match walking speed but were combat-effective. Modern technology has allowed a delicate balance where mobility, despite being the lowest priority in MBT design can still retain a high degree of reliability when survivability and firepower capabilities become obsolete. Despite this, mobility is still crucial when undertaking programmes such as CLEP. Ignoring this factor could lead to severe problems with reliability, both from an ageing powerplant and transmission or mechanical faults brought about by increased weight or poorly-implemented powerplant improvements for example. One conclusive point can be reached with this argument. It is clear, that without proper understanding and commitment to future armoured forces, the United Kingdom, the United States and NATO overall as a capable armoured force will be at a severe disadvantage against a modernised Russian ground force spearheaded by the T-14. The decision to extend the life of the Challenger 2 stockpile under the CLEP programme is merely a stop-gap undertaken by the British government rather than identifying the need for an entirely new vehicle capable of not only matching the T-14 but also providing sufficient scope for future upgrades. The same can be said of the American M1A2. One recommendation for overcoming this obstacle is greater NATO cooperation. Given that the majority of NATO armoured assets exist in the form of German made Leopard 2 MBTs, using this as a base for a NATO-wide standard tank not only would simplify logistical needs, but also provide a singular research and development focus rather than individual programmes.8 This may seem impractical politically, but the financial and technological advantages that such cooperation would provide, particularly to the smaller members of NATO would be invaluable in the long term, rather than continuing with individual programmes which do not fulfil a long term requirement. This conclusion however, does not seek to invalidate the aims of CLEP and comparable American programmes. On condition that they fulfil an interim requirement, the adoption of minor upgrades such as an APS system would be of immense value in terms of financial and operational cost. With the current chassis limitations of both tanks, firepower upgrades cannot come in the form of new guns or auto-loading systems unless major engineering alterations are made, which limits possible upgrades to command and control and ammunition advancements. Mobility, perhaps being the least of NATO’s worries, does not present as large an obstacle to upgrades as the other two points, but should still be considered when factors such as increased tactical weight and strategic mobility are considered. In sum, the T-14 has clearly forced both the British and American governments into action to try and match the new technology, but without future planning, Challenger 2 and M1A2 can only be taken so far before they become obsolete without a credible replacement yet to be announced. Will Flannigan is a former military history student focusing on Cold War and current military matters, ranging from Britain’s nuclear deterrent to armoured warfare and air power. See Heinz Guderian, Achtung Panzer! (London, 1992); Patrick Wright, Tank: The Progress of a Monstrous War Machine (London, 2009), Richard Simpkin, Tank Warfare: An Analysis of Soviet and NATO Tank Philosophy (London, 1979). Ministry of Defence, ‘Securing Britain in an Age of Uncertainty: The Strategic Defence and Security Review’ (2010), https://www.gov.uk/government/publications/the-strategic-defence-and-security-review-securing-britain-in-an-age-of-uncertainty, retrieved September 2018. British Army, ‘Challenger 2 Specifications’, https://www.army.mod.uk/equipment/combat-vehicles/, retrieved August 2018. Grant Turnbill, ‘AUSA 2017: US Army Contracts for Abrams Trophy Fielding’, https://www.leonardodrs.com/news-and-events/in-the-news/ausa-2017-us-army-contracts-for-abrams-trophy-fielding/ (September 2017), retrieved September 2018.; Leonardo DRS, ‘Trophy Active Protection System (APS)’ http://www.leonardodrs.com/products-and-services/trophy-active-protection-system-aps/, retrieved September 2018. James Bingham, ‘Challenger 2 trialled with ROSY, Iron Fist APS’, Janes 360 (16th November 2017), https://www.janes.com/article/75743/challenger-2-trialled-with-rosy-iron-fist-aps, retrieved September 2018. Some T-55 MBTs were fitted with an early hard-kill APS known as ‘Drozd’ in the late 1970s. The system never saw widespread adoption due to shortcomings in the design. Lars Hoffman, ‘German Rheinmetall works on new 130mm tank gun’, https://www.defensenews.com/digital-show-dailies/eurosatory/2016/06/15/german-rheinmetall-works-on-new-130mm-tank-gun/, June 2016, retrieved September 2018. Although short-lived, previous programmes such as the American-German MBT-70 programme prove that such cooperation is possible. Outside of armour-based programmes, examples such as the adoption of 5.56mm and 7.62mm ammunition, 155mm standard artillery guns and compatible command and control systems are further proof that large-scale NATO projects can succeed with enough backing.